Finally made it to the theater this week to see Brooklyn. I thoroughly enjoyed this heartwarming tale and beautiful love story. Saoirse Ronan (pronounced Ser-sha, like inertia, thank you Ryan Gosling) shines as a young Irish immigrant striking out on her own to find opportunities in America. It’s not hard to see why she was nominated for her second Oscar for playing this role. Add in two dreamy leading men, played by Emory Cohen and Domhnall Gleeson, and you are in for a good time. 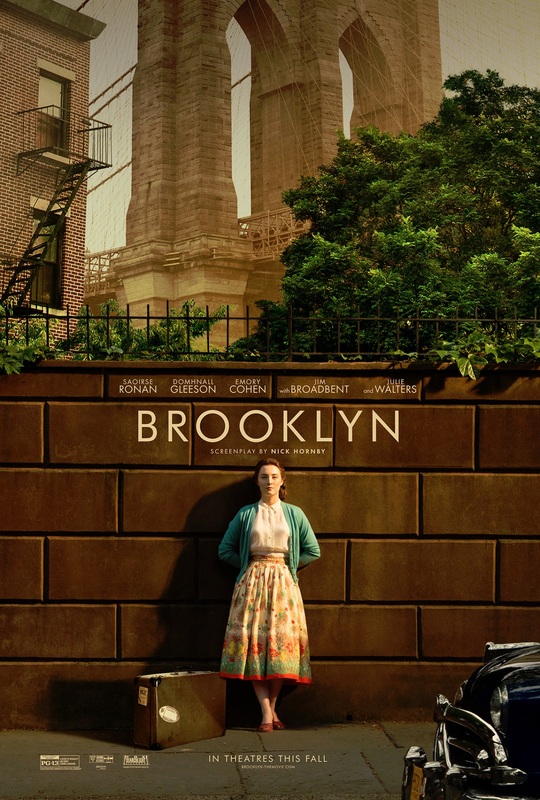 BROOKLYN tells the profoundly moving story of Eilis Lacey (Saoirse Ronan), a young Irish immigrant navigating her way through 1950s Brooklyn. Lured by the promise of America, Eilis departs Ireland and the comfort of her mother’s home for the shores of New York City. The initial shackles of homesickness quickly diminish as a fresh romance sweeps Eilis into the intoxicating charm of love. But soon, her new vivacity is disrupted by her past, and Eilis must choose between two countries and the lives that exist within. The talented Jim Broadbent plays Father Flood, Eilis’ mentor while she is in America. Comedy relief is provided by Julie Walters, as the boardinghouse matron, and the “giddy” girls who live there with Eilis. Loved seeing my favorite character from Arrow, Emily Bett Rickards, on the big screen. But lets get to the good stuff, the fashion! I adored the 1950s costumes in this movie. I pretty much wanted to take home everything Eilis wore. Seriously, that green bathing suit is my dream. And how fun does Coney Island look? Have you seen Brooklyn yet? Let us know what you thought in the comments.